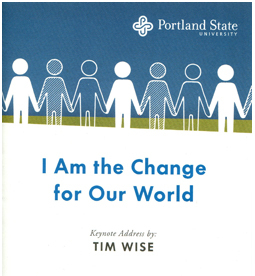 Tim Wise is a prominent anti-racist educator and the author of seven books, including Dear White America: Letter to a New Minority. His lecture at PSU couldn’t have been better timed for Portland’s bike activists. Recently, the subject of racism was heavily debated on BikePortland.org. At the inaugural Veloprovo bike ride, participants believed they were accompanied by an undercover Portland Police officer named Chris Uehara, after spotting a quiet man filming the event who “stood out” from the crowd. It turns out the man in question was Krisapon Chaisawat, a man new to town looking to meet people while riding his bike. Pictures of the two men appeared side-by-side in an article on BikePortland.org, and several people speculated that they were the same person. The two men are both of Asian descent. After reading about this incident, many people asked, “Is this racism?” The intent to hurt someone may not have been there, but the reality is that racism exists regardless of whether or not it was intentional or deliberate. However, it is helpful to examine how we engage in this discussion. When we do take the risk and speak out against racism, it is more constructive to focus on a person’s words or actions rather than simply calling someone a racist. In our society, we deal with issues of racism with a good person/bad person binary in which a person is labeled a racist or not a racist. This false dichotomy makes it challenging to have a conversation about race. Instead, one should focus on a person’s words and actions and how they impact people of color. When I think about how all of this relates to bicycling activism in Portland, I am reminded that we collectively need to work much harder on creating a more welcoming and accessible bicycle culture and environment for people of all backgrounds. We can’t achieve this by continuing to shut down when the topic of race presents itself in media or in our daily lives. We can’t achieve this without examining our imperfections. And we need to look beyond bicycles. A lot of our most important racial issues are institutional and systemic, with disparities impacting all facets of our society from health to education to employment opportunities and more. When I walked out of Stott Center, I left feeling inspired and full of hope. Clearly people in Portland are hungry for this type of dialogue and have been for a long time. My hope for the future is that we can continue to listen and learn from one another, engage in healthy racial discourse, while not being afraid to hold each other accountable for the impact of our words and actions. Radical Accountability vs. Security Culture: An Unconditional Apology for My Racism – An apology from a Veloprovo ride participant. Meeting Captain Chris Uehara – BikePortland’s interview with Captain Chris Uehara. TimWise.org – Tim Wise’s website, featuring his blog, essay archive, audio & video, and information on each of his books. Jay Smooth – How to tell someone they sound racist (video) – A really helpful and quick guide to discussing racism. Race Talks: Opportunities for Dialogue – This series, held at the Kennedy School, deals with race in Oregon, both historically and up to the present time, to provide learning experiences that support the development of racial identity and sensitivity. Coalition of Communities of Color – In 2001, leaders from communities of color across Portland formed the Coalition of Communities of Color. They address the socioeconomic disparities, institutional racism, and inequity of services experienced by people of color. Check out their research page for a full list of reports and papers. Colorlines.com – Colorlines.com is an award-winning investigative reporting and news analysis website. They believe that instead of being defined and divided by racism, we can become uplifted and united by racial justice.